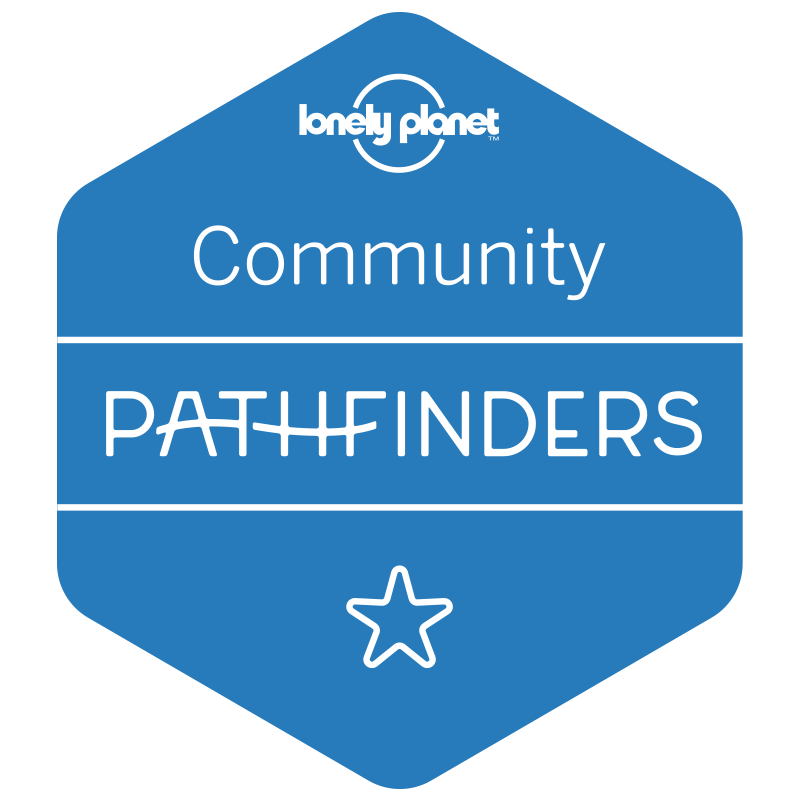 While we have worked with backpackers a lot over the years, it’s been quite a while since we have been backpacking ourselves and we have not been backpacking in Sydney so today we have reached out to some experts who have backpacked in our fair city recently for their advice. 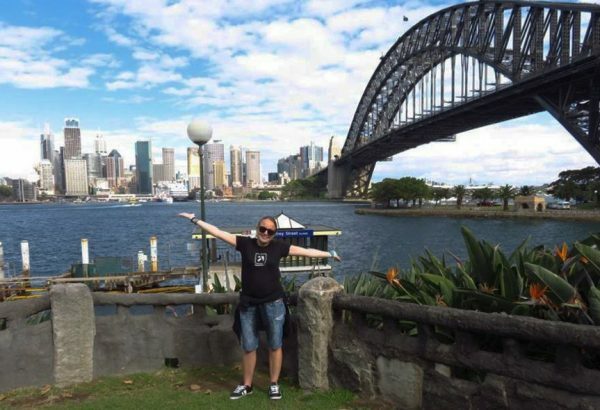 They cover the best hostels and a bunch of cheap but fabulous things to do in Sydney. We hope these tips will help you save some money and have a great time on your trip. Learn how to take advantage of Sydney’s public transport caps. 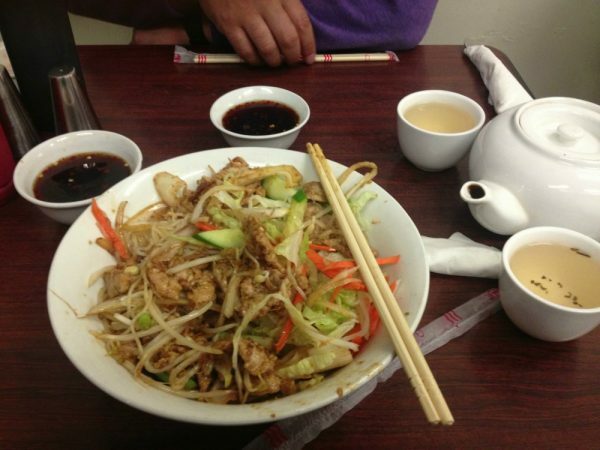 Hunt down some cheap eats. Sydney is well known as being one of the more expensive cities to visit so it is good to have a basic idea of the costs before you arrive so you can sort out your budget. Ideally, you will have at least $60 a day to get by on in Sydney and a fun stay will cost you closer to $100 or more. Many longer staying travellers move from hostels to share accommodation pretty quickly to keep costs down. Unless you are a kiwi cousin, you will need a visa to visit Sydney. There are a few options, but the main ones for short term visitors are the e-visitor, for EU citizens and the Electronic Travel Authority (ETA) for other nationalities. Both allow stays of up to 90 days. 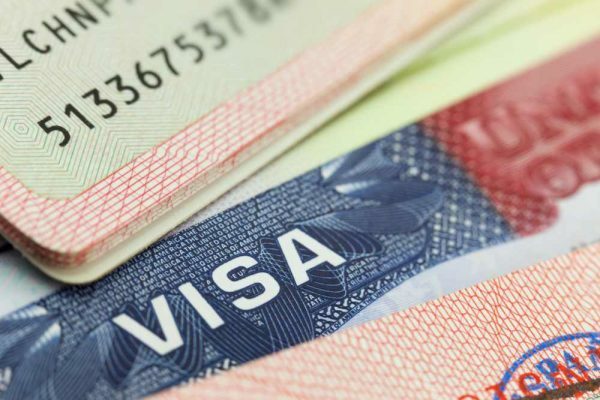 If you wish to stay longer, or you are from a country not covered by the first two options you can apply for a standard Visitor visa which allows for stays of up to one year. You can access the list of eligible countries here. I recommend you visit the Home Affairs website to determine which visa best suits your need. There is no need to apply via an external agency, particularly if they have additional fees. Often your travel agent can help with an ETA or E-visa application. E-visitor and Visitor visas are free only the Electronic Travel Authority has a fee ($20). Some visitors aged 18-30 can apply for permission to work during their visit. If you hold a passport from one of the select countries listed you can work for one year in Australia. Find more details and apply via the Home Affairs website. So that’s enough from us, what did our backpacking bloggers have to say about saving money on your trip to Sydney without missing out on the good stuff? Nitha, who writes at The Trailing Mom managed to get her head around the Opal card and public transport in Sydney and offers her advice. “Sydney is a hot destination for backpackers, and even though the living expenses in Sydney are on the higher side, backpacking is not uncommon here. With a little bit of planning and understanding of the services available, you can cover the top attractions in Sydney pretty easily by public transport. Sydney’s public transport system is well organised and user-friendly. It consists of a network of trains, buses, ferries and light rail. Ticketing is by a smart system called Opal which seems complicated by really is not. You can add value to you Opal card and then use it to tap on & tap off at any public transport in the network. The Opal Card offers amazing travel benefits among them; the Sunday Travel Cap is the most beneficial. On Sundays, you have unlimited access to Sydney public transport services for a maximum of AUD 2.70 per person. That means you can comfortably travel all day on Sydney trains, buses, light rail and ferry services for just 2.70 AUD which is an absolute bargain. You can follow Nitha on Pinterest to see more of her travels. 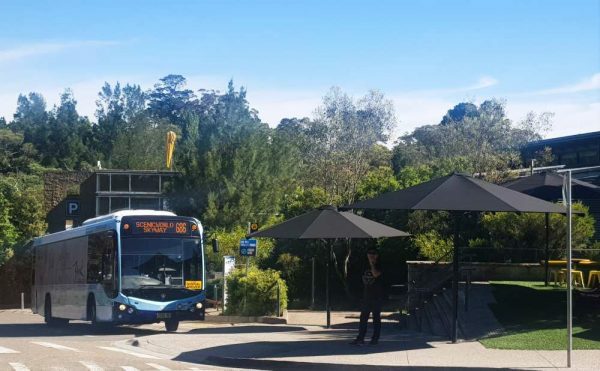 We have several detailed articles that can help you navigate your way from Sydney Airport to the city including advice for taking the airport train and details on that cheap airport transport hack we mentioned earlier. 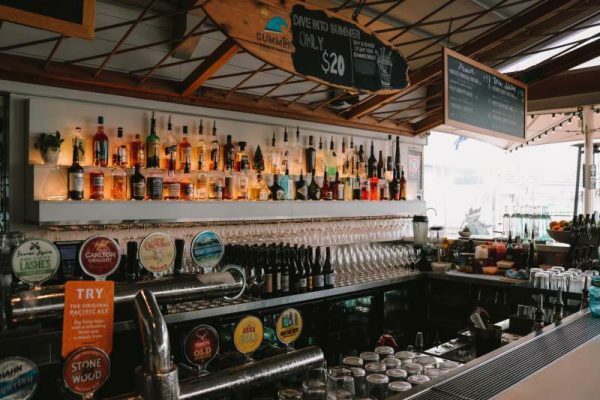 We asked Sydney based blogger Holly from THATraveller to share her favourite local places for bargain drinks. 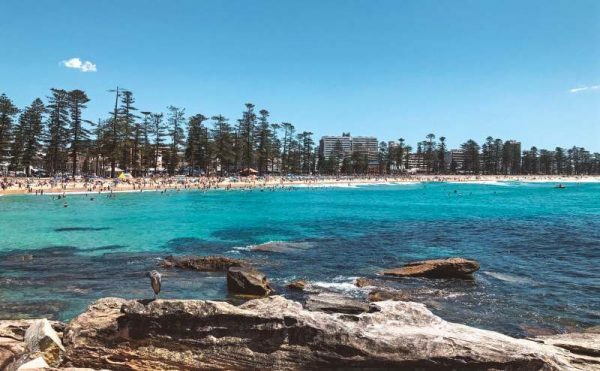 Holly is based on the Northern Beaches when she is not off exploring the world, so her tips are perfect for that day trip to Manly. “Just along the shore from the ferry, Manly’s Corso transforms into the perfect hub for nightlife on the beaches. From pubs to nightclubs, to quaint eateries with cocktails to-die-for, there’s something for everyone. If you’re like me, you love a good bargain – and if you’re a backpacker, Manly is very kind to you. The Bavarian Bier Cafe on Manly Wharf lets you enjoy the best of Germany, a whole sausage menu and crispy beers. Mondays are the days for hospitality workers and those with working visas, so if you show your RSA card, you can get happy-hour prices all night! For a taste of local live bands, Henry’s (previously Moonshine) is one of the most well-known destinations for both backpackers and regulars. Not only this, it’s located on the top floor of the historic Hotel Steyne – Manly’s largest and most renowned pub. If you fancy walking off some of those drinks Holly has a great post on coastal walks that you should read. Also, check out her travels on Instagram – she takes a great pic! Danielle from Live in 10 Countries has some helpful tips about making your food budget stretch a little further. She also has a great article on Working Holiday visas that may be helpful. “One thing every backpacker agrees on in Sydney – ‘great place, pricey though!’ It’s not that Sydney is very expensive as a city, but that you’re likely on a tight daily budget for a trip and when you don’t know a place, you often stumble into the most expensive of options. Asian food in Sydney is good and cheap! When it comes to food, you want to try some of what the locals eat and not splash out too many dollars. First, stop eating out for dinner and make it a lunch date instead – you’ll get great lunchtime specials across the city especially nearing 2 pm when the office workers are back at work, and the shops and cafes mark down the unsold meals. Hunter Connection near Wynyard Station is a little run down looking but the food is cheap and tasty. 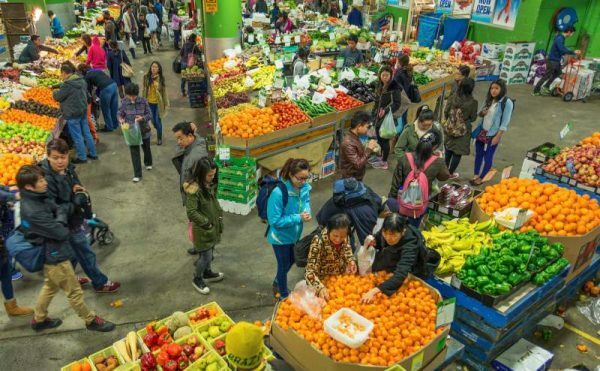 Paddy’s Markets is a great spot for cheap fresh food. Paddy’s Market near Central Station has a fresh food section that sells fruit and vegetables for much less than retail. You can grab considerable discounts in the early afternoon. Next, sniff out some great local Asian groceries, they are great value and very popular with a lot of people in Sydney. From snacks to fresh produce and easy meals to eat at home, these are the best places to shop. You can follow Daniella’s journey on her Facebook page. 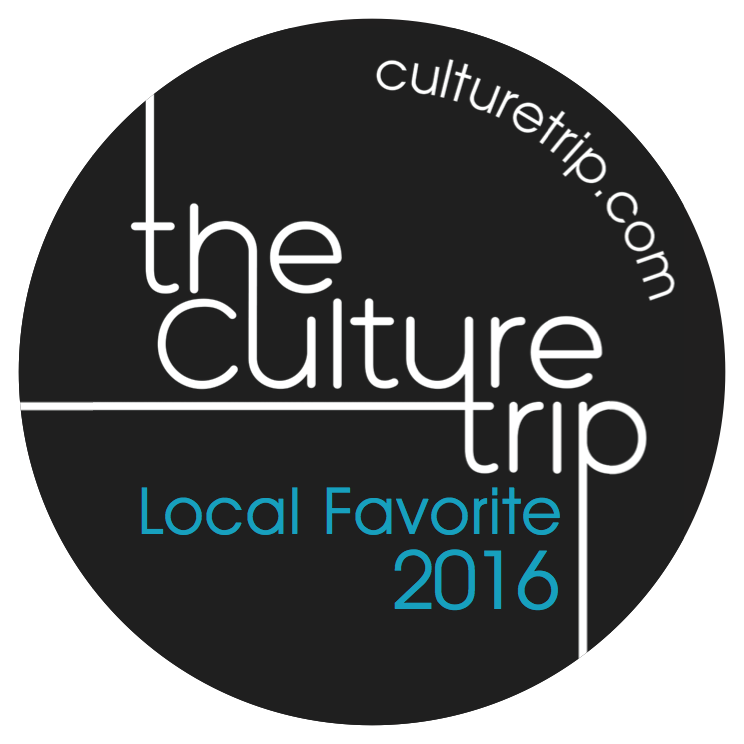 Wendy from The Nomadic Vegan is a fan of free walking tours, as are we. 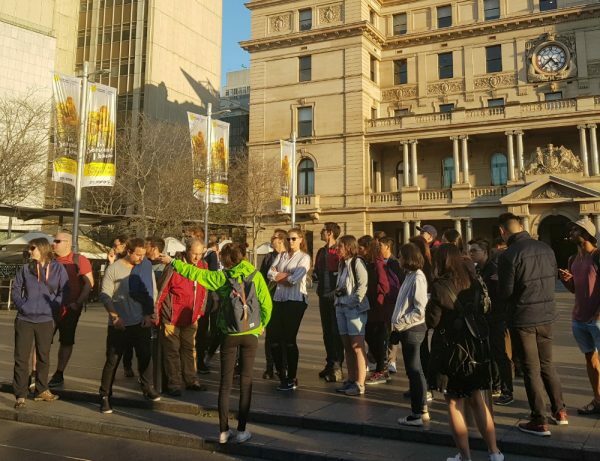 “There are free tours running in Sydney every day, rain or shine, and if you join the “I’m Free” walking tour you don’t even need to book in advance. You can just turn up at the meeting point and look for the guide, who will be wearing a bright green shirt. This company offers tours of downtown Sydney that start from Town Hall Square daily at 10:30 am and 2:30 pm, that give a good introduction to Sydney, as well as a tour of the Rocks district that start at 6 pm at Cadman’s Cottage. The Rocks tour is an excellent way to learn more about the history of colonial Sydney. If you are vegan I recommend you take a look at Wendy’s list of the best Vegan dining options in Sydney on her website. You might also like to check out our posts on Sydney Greeters, a volunteer organisation in Sydney who offer free 3 hour tours with a local. Dave from Jones Around The World spent time in Sydney on a working holiday visa which gave him time to check out lots of great walks. 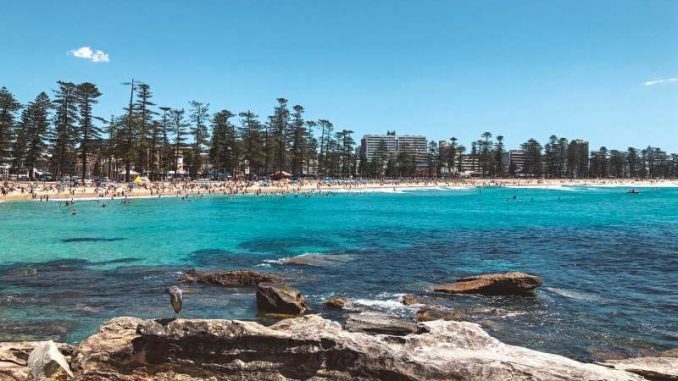 “Sydney is one of the best outdoorsy cities I’ve ever visited, and that’s one of the main reasons that made me decide to live there when I was backpacking in Australia on a working holiday visa. While it is known for being a bit expensive, it’s also loaded with tons of free and breathtaking outdoor activities. My favourite – hiking along the unbelievably scenic coastal walks! Dave is right; our coastal walks are stunning. One of our favourites is the track from Taronga Wharf to Balmoral Beach, this walk hugs the harbour, and it’s a nice contrast to the beach walks. 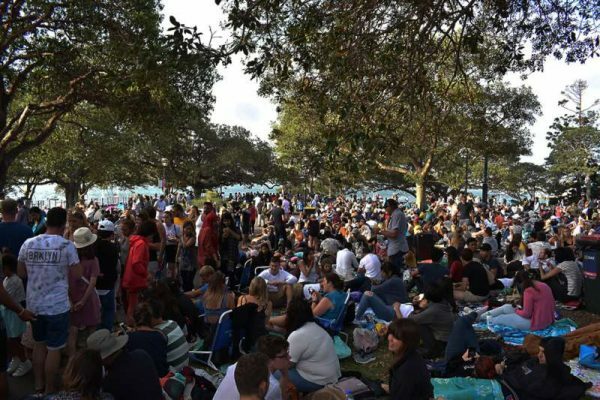 Lots of backpackers arrive in Sydney just before New Year’s Eve with no plans and no idea of the best free options. Alex Trembath from the blog Career Gappers went along to the NYE backpacker hotspots and shared his experience. “There are many reasons why December is a great time for backpacking in Sydney, not least the opportunity to see the legendary New Year’s Eve firework display. With over a million people competing for views around the harbour, however, finding a good free vantage point can be difficult. We saw the display from Mrs Macquarie’s Chair – which we’d heard was the best free spot – and we were not disappointed. The grassy peninsula juts out to the east of the harbour, offering a pristine view of the Opera House, and bridge. To secure a place you need to get there early. We arrived shortly after 6 am, and within an hour the queue was over 10,000 deep (the maximum capacity is 14,000). We spent most of the morning queueing, but it was infinitely worth it for the spectacle later. Bring some games and a picnic, and you’ll be fine! Don’t try and bring drinks in though, as they’ll probably be confiscated. At 9 pm there is a smaller firework display for families. Many people leave after that, so by midnight, it’s a lot less crowded. 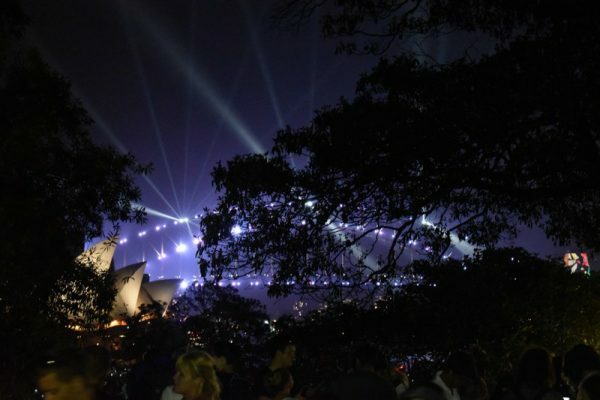 All that’s left is to enjoy the main show.” Read all of Alex’s 16 tips for enjoying the Sydney fireworks show from this fabulous spot. You can also follow Alex on Facebook to stay up to date with his travels. If you are planning on being in town for NYE, then you might also like to check out ‘mega list’ of the best ways to celebrate NYE in Sydney. It covers everything free vantage points to dance parties, harbour cruises and big budget splurges. 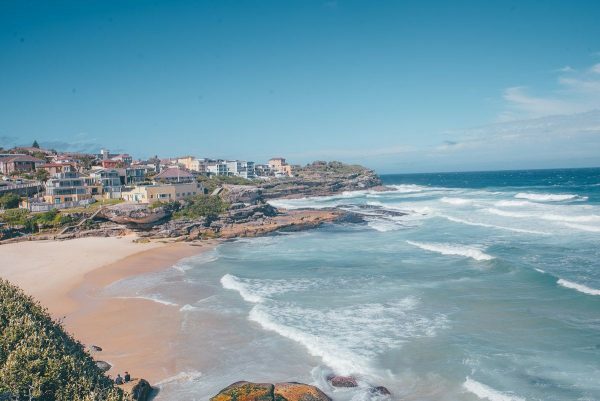 Laura from Escapes Etc is in Sydney on a working holiday which has given her plenty of time to get to know the place, and she wants you to go west! 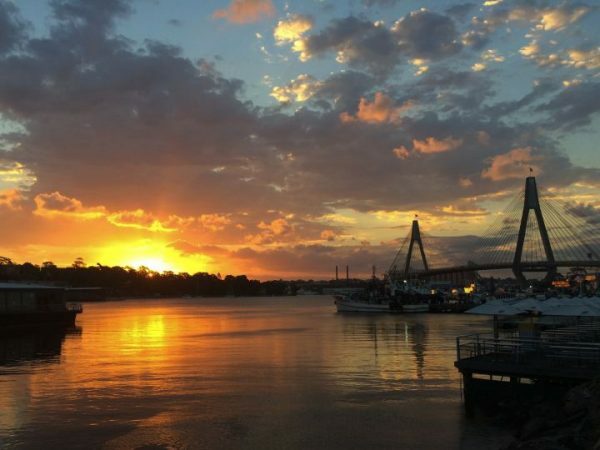 “While Sydney’s beautiful harbour may be the place to tick an iconic site off your bucket list, don’t be afraid to delve into the suburbs. Sydney’s Inner West is teaming with bars, boutiques, coffee and Aussie culture. 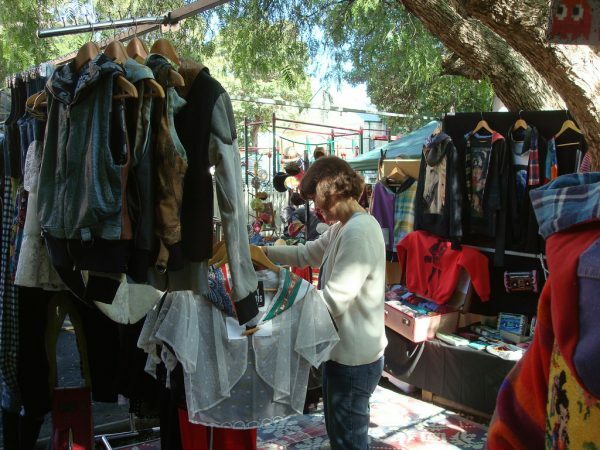 If you’re visiting on the weekend and are looking for some retail therapy, be sure to find some pre-loved treasures at the famous Glebe market. Glebe Market in Sydney is a great spot for pre-loved goods. 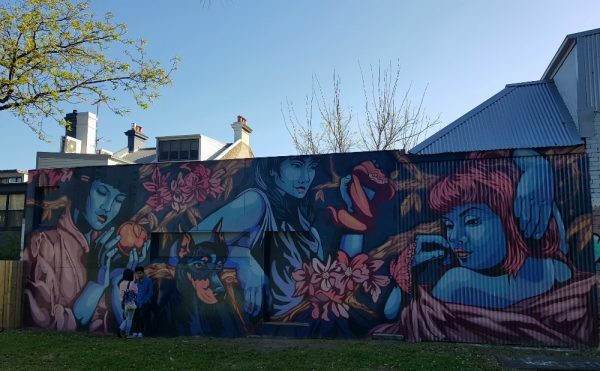 If you want to take her advice and explore Newtown and Enmore checkout our self-guided Inner West street art walk. Marijs from Rooftop Antics is another who loves the inner west. “Where is the best suburbs for backpackers to set up camp in Sydney? Let me introduce you to Glebe. cuisine. Glebe Point Road is filled with high-quality food and the best part? You can walk through the whole suburbs, no car needed when you live in Glebe! 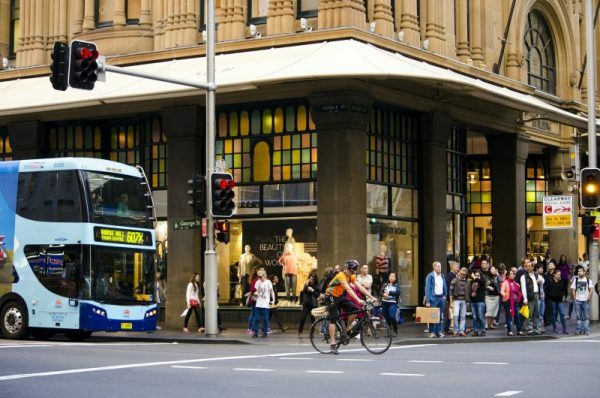 You can even walk to Broadway, one of Sydney’s best malls, and all the way into the CBD. Sunset at Pyrmont with the Anzac Bridge in the background. Follow her travels around Australia for more great tips. “Sydney is home to some of the most iconic landmarks in the world, the Opera House and Harbour Bridge. These famous sights may steal the limelight when it comes to visiting Sydney but, when searching for your next night out why not go beyond the guidebook and explore a little further? As backpackers who are very much over the night club and party scene, we tend to venture outside the box when looking for local nightlife. 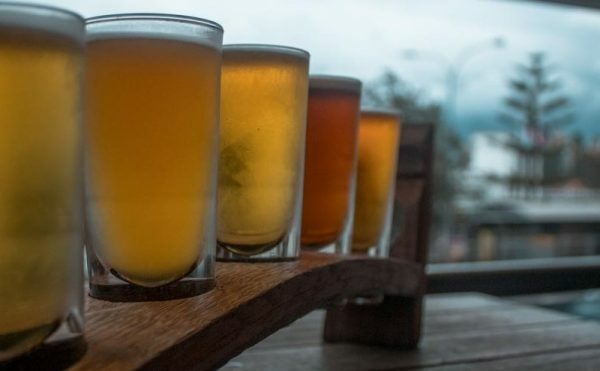 We usually find what we’re looking for in a good brewery and Sydney has plenty to choose from. You can follow Alicia on her Instagram to see what other gems she uncovers. Crystal from Castaway with Crystal suggests a visit to one of the harbour’s most historic islands. “Cockatoo Island is one of the best things to do in Sydney Harbour, hands down! The island has a long history and has been everything from an old Navy submarine workshop, to jail, and now finally a tourist destination. A gigantic original factory still stands and is often used for exhibitions and performances, while the area where the submarines and boats were pulled from the water can be seen as well. Be sure to take a walk past the in-ground silos, and read about their fascinating history (hint: people died in them). Take a self-guided tour of the old jail and walk through a mineshaft that runs through the small hill in the island. 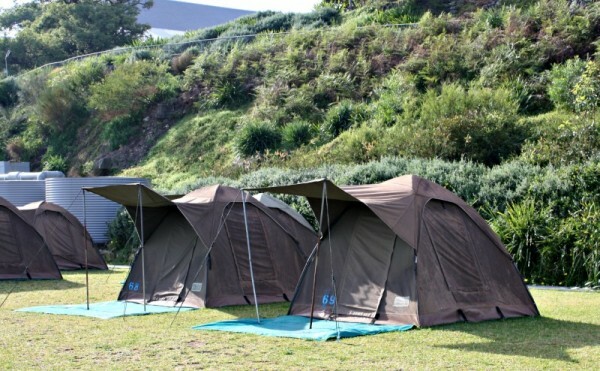 Cockatoo Island offers basic campsites as well as glamping experiences. 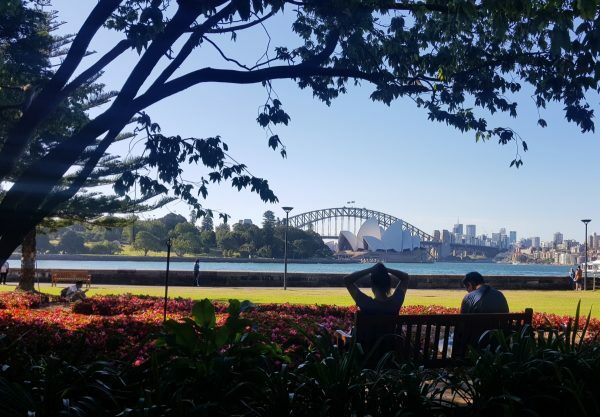 If you want more ideas check out her post on romantic things to do in Sydney on a budget for some great advice. Anna who writes at AnnaSherchand.com about her travels to over 37 countries shares our love of the Blue Mountains and thinks that even solo travellers should head up to explore the area. “While you are in Sydney, don’t miss out on the Blue Mountains. It is the national park area that expands west of Sydney. It is famously known for its dramatic scenery, massive forests, refreshing waterfalls, steep cliffs, and villages with guesthouses, galleries and gardens. Katoomba is the main town in the mountains and a good place to start exploring the region. Following are the things you can solo or with others. We have a bunch of content on the site to help you follow some of Anna’s tips. I suggest you start with How to plan a trip to the Blue Mountains. “I was only meant to be in Sydney for a week. Cut to two months later am I’m still there. Railway YHA was the first hostel I stayed in as a solo traveller, and I was so nervous about meeting people or fitting in. It turns out it was easy peasy. The hostel has such an open and friendly atmosphere, with a lovely common area that it is incredibly easy to make friends. The Botanic Gardens are the perfect place for an afternoon rest. As for things to do around the city, if there’s a Botanic Garden nearby, I’m there! It’s free which is a bonus, and it’s just beautiful to be immersed in nature, in the middle of a big city. It’s a getaway from the hustle and bustle without having to go very far. It also just so happens that the Sydney Botanic Garden is located right next to the opera house. Chiara is currently exploring Queensland; you can follow her travels on Instagram. Bryony from Coasting Australia is an old hand at backpacking; in fact, these days she also backpacks with her family in tow and has written a guide to the hostels for families. 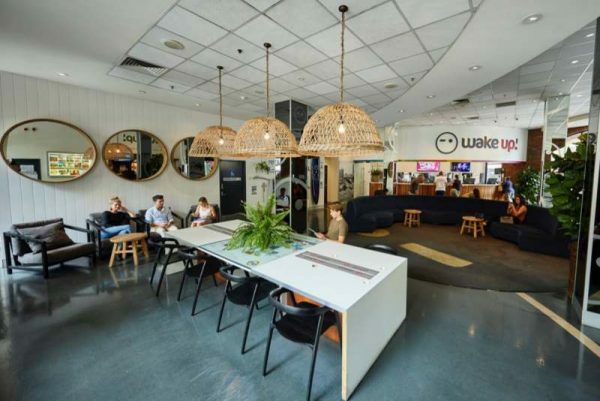 “My absolute favourite backpackers to stay at in Sydney is Wake Up! 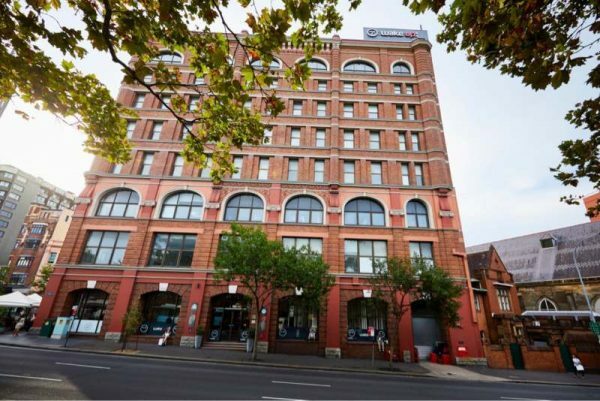 The hostel is on Pitt Street, just a few minutes from Central Station so easy to find, and ideally located for all the attractions and entertainment in Sydney. Wake Up! is a large hostel so has all the facilities you need, and everything is modern and super clean. One of the things that make it such a great hostel is the staff – everyone is so friendly, so it’s brilliant if you’re travelling alone and need to make friends and get local tips. 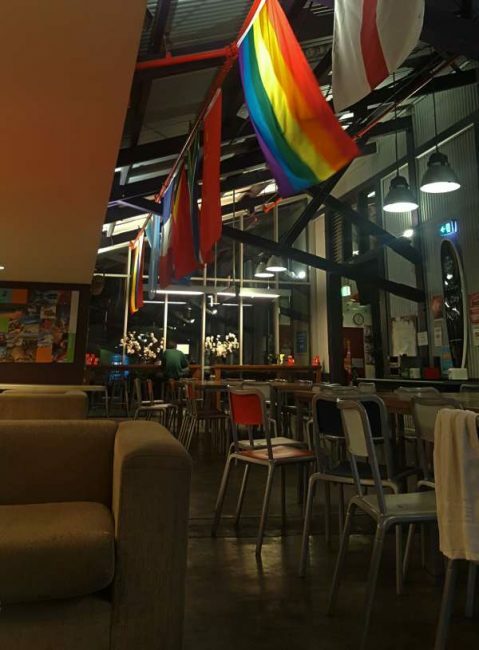 There is also one of Sydney’s best backpacker bars in the basement – Side Bar, and there are free activities and events happening every day and night. Bonus – all guests get free high-speed wifi!” I have to agree with her Wake Up is a great spot to stay if you like large modern hostels with excellent facilities. It also in the middle of Sydney’s transport hub so getting around is a breeze. Byrony has recently launched a website for vegan travellers that has a great list of vegan eats in Sydney that you might like to check out. 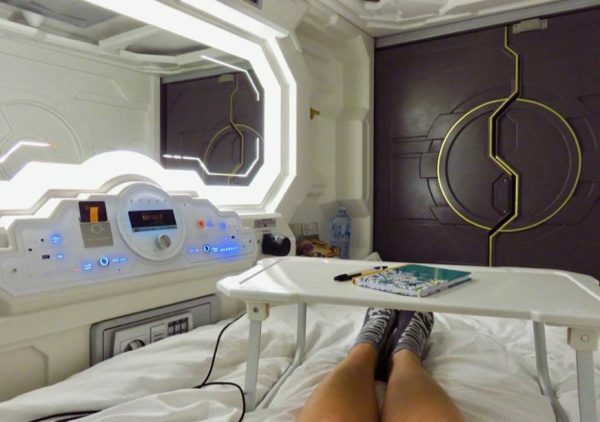 Kylie from Between England and Iowa spent some time in a capsule hotel and decided they are perfect for those who want a little more privacy than a hostel! “The Capsule Hotel in Sydney is an accommodation option halfway between a hostel and a budget hotel, located on George Street. For those that are used to sleeping in a hostel, the Capsule Hotel gives you an extra layer of privacy. The capsules are clean and modern. Each ‘bunk’ has a solid door (with keycard access) and walls. There are multiple charging outlets and power points, lights, a small safe and a mirror. I loved the way I could chill out in my ‘pod’ with the lights on, without the worry of disturbing other people in the room. I had somewhere private to change, and I could leave stuff on my bed without the fear of things going missing. The keycard also opened a large locker which matched the number on the capsule. There is plenty of space to store luggage, and the lockers come complete with a rail and clothes hangers! Kylie enjoying the view from North Sydney. Dave from Jones Around the World suggests the YHA located in the Rocks is the go. The YHA in the Rocks has a great view of the city from the rooftop deck and you just a few minutes stroll to pubs and the harbour itself. I wholeheartedly agree with Dave on this; the YHA Sydney Harbour is my favourite hostel in Sydney too! Follow Dave on Instagram to check out more of his travels. 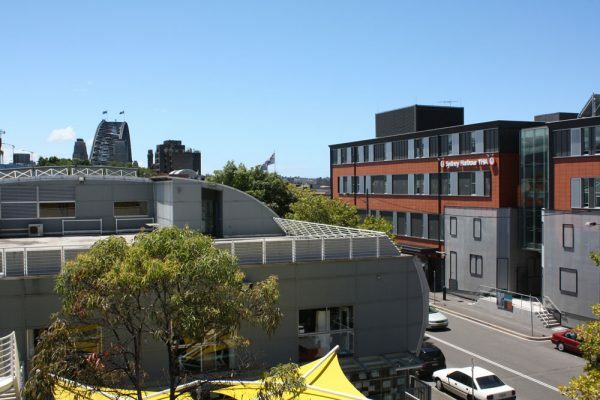 If you want budget accommodation but need a few nights away from the hostel crowds check out our list of the best budget hotels in Sydney. Sometimes these are the same price as a private room in a decent hostel. So there you go. Some of the best advice we could gather from our backpacking buddies. If you have a great tip please leave us a comment. If you have a question head over to our Facebook Group where there are a bunch of Sydneysiders and previous visitors to help.